Ancient Egypt is one of the earliest world civilizations located along the lower Nile or Hapy - like the ancient Egyptians called it, what is today’s modern Egypt. 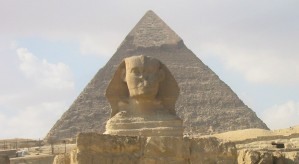 The emergence and rise of the civilization of ancient Egypt is closely tied with insufficient natural rainfall to grow crops which forced the ancient Egyptians to develop artificial irrigation system and to take advantage of the annual floods of the Nile which could be precisely foretold. The flooding started every year in mid June at the time of summer solstice when the brightest star of the Canis Major, Sirius became visible just before sunrise. The Nile flooding reached its peak in September when the ancient Egyptians celebrated the new year. However, besides the water necessary for irrigation the Nile flooding also made the surrounding land very fertile by washing ashore the rich sediments from the Ethiopian Highlands. Irrigation of the land to produce enough food required cooperation and collaboration of people as well as good organization which eventually led to emergence of a centralized state organization. Ancient Greek historian Herodotus named Egypt the “Nile’s gift” because the Nile was crucial for emergence of civilization of ancient Egypt.